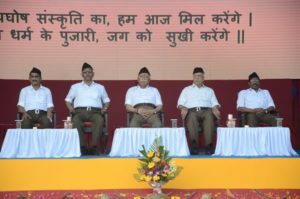 You Are Here: Home » Summary of the address of Sarsanghchalak Dr. Mohan Bhagwat Ji on the occasion of Vijayadashami Utsav – 2017…. 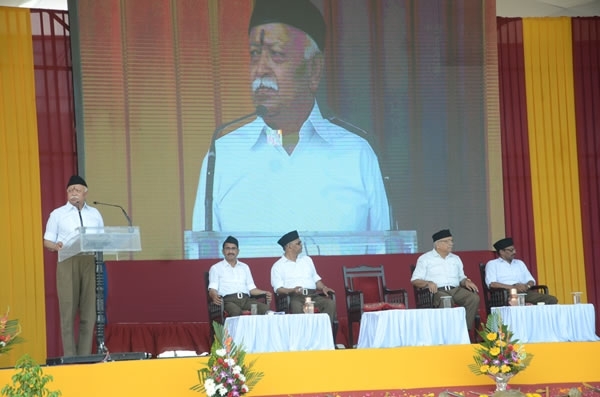 Summary of the address of Sarsanghchalak Dr. Mohan Bhagwat Ji on the occasion of Vijayadashami Utsav – 2017…. We have assembled here to celebrate the pious occasion of this year’s Vijayadashami. This year is the birth centenary year of Venerable Padmabhushan His Eminence Kushok Bakula Rinpoche. This year is also the 125th anniversary of Swami Vivekananda’s historic Chicago speech and 150th birth anniversary of his renowned disciple Bhagini Nivedita. The Buddhists of entire Himalayan region consider His Eminence Kushok Bakula Rinpoche as the incarnation of Bakul Arhat, one of the Sixteen Arhats of Thathagat Buddha. He has been the most revered Lama of Ladakh in recent times. He played a crucial role in spread of education, social reforms, eradication of social evils and awakening of national consciousness in the Ladakh region. In 1947 when Pakistan army attacked Jammu and Kashmir in the disguise of Kabaili tribes, with his inspiration youth from Ladakh formed the Nubra Brigade and did not allow the aggressors to cross Skardu. His remarkable contribution as a member of Jammu and Kashmir Legislative Assembly, as a minister in the State Government and as a member of Lok Sabha was always with national perspective. He was the Ambassador of Bharat to Mongolia for 10 long years. During his tenure in Mongolia, his contribution to the successful efforts of the local population to revive the age old Buddhist tradition, after the end of 80 years of Communist rule, was outstanding. For this, he is still being revered in Mongolia. In 2001, he was conferred with the Mongolian Civilian Award “Polar Star”. He is revered and exemplary for all of us because of his spiritual wealth, unwavering national commitment and incessant selfless work in the public interest. Acharya Bakul manifested the same national vision of Bharat towards global humanity through his personal and social conduct which Swami Vivekananda had declared in his Chicago speech. This national vision is our heritage. With the objective of awakening this vision only, Adi Kavi Valmiki chose Maryada Purushottam Sri Ram as the subject matter of his eternal epic Ramayana. One of the most revered Saint of Bhakti Movement Ravidas Ji Maharaj, who is also a faith and inspiration for our today’s guest of honour, also spread the same vision amongst common masses through his deeds and words. Bhagini Nivedita also undertook the efforts for social awakening and enlightenment to arise the Hindu society based on the same national ideal. By relentlessly serving millions of children of Bharat to free them from ignorance and dearth, she inspired them by awakening their minds towards veneration of Swadharma and Swadesh. To awaken the society towards national ethos and endeavour, it is a prerequisite that our intellectuals and thinkers get rid of the ill-effects of the colonial thought and mindset. These ill-effects emanating from the colonial era has engulfed our minds and made us self-abominating, confused and murky. Bhagini Nivedita’s successful endeavour of getting integrated with mind, eternal values and Sanskaras of Bharatiya people, inspite of being born and brought up in European culture is an inspiration for us all to be one with our eternal national vision and values. Rashtra is not made artificially. 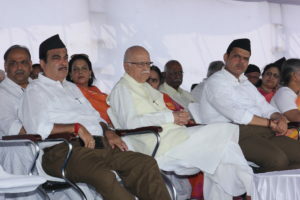 Our existence as Rashtra is based on Sanskriti and people, which is unique and entirely different from the nation-state concept rooted in power. Our Sanskriti, that binds us together in a common thread despite our different languages, regions, sects, religions, castes, customs, etc, and the source of this Sansrkriti, our eternal life values that envision humanity as a global family, is our collective bonding spirit. That life vision of nationhood takes shape through collective experiences we have gained on this land from the time immemorial, collective efforts we have taken and collective understanding and realisation of the Truth obtained from those experiences. The same sentiments resonate in individual, familial and social dimensions of life. Then only a Rashtra evolves in the real sense; it gets the recognition of the world; such nation only can make a meaningful contribution by playing the expected role in global life. Slowly but surely, we are partially experiencing this eternal truth in the present condition. Due to our initiative, there is a recognition and acceptance of Science of Yoga and our approach towards environment, which gives a feeling of great satisfaction and pride about our ancient heritage. In response to the activities of Pakistan on the Western front and that of China on the Northern front, Bharat’s strong and determined stand has been visible in the incidents like Doklam, on the borders as well as in international diplomacy. This definitely makes us realise about our strength and at the same time provides new international standing to Bharat. In the space science also brave achievements by our scientists one after another are proving our intellectual power. On internal security front systems are improving. The infrastructure, especially related to surface transport, is rapidly spreading even in the bordering states like Arunachal Pradesh. For the respect and progress of Women various schemes like ‘Beti Bachao, Beti Padhao’ are also going on. Through initiatives like Swachhata Abhiyan a sense of duty among citizens is inculcated, ensuring their participation. Attempts to introduce many small and big systemic reforms and efforts to fundamentally change the thinking process in certain fields are kindling new hope among the common masses, at the same time level of expectations is also ascending. There is a prevalent discussion in the society on many things that are happening, how that can be further improved and what else should happen. For instance, the determination with which terrorist infiltration and firing from across the border is being dealt with is appreciated. All security forces, including the Army, have been given the freedom to do their respective duties. The provocative actions and propaganda of the separatists is effectively controlled by curbing their illegal financial sources and exposing their linkages with anti-national terrorist forces. The positive effects of this strategy are visible on the ground. Still, there is an urgent need to take the benefits of development to the masses in the entire State of Jammu and Kashmir, including the Jammu and Ladakh regions, without any discrimination and through transparent and clean governance. The problem of refugees is still not resolved in the State. For decades together, some generations are living through this miserable state of refugees for their decision to be in Bharat and remain as a Hindu. Despite being citizens of Bharat, they are still far away from the basic facilities of education, employment and democratic rights, and leading a backward life. This is happening just because the discriminatory provisions in the state of Jammu and Kashmir that denied them the fundamental rights. The problems of permanent residents of state who migrated from the Pakistan occupied Jammu-Kashmir in 1947 and the people who were displaced from the Kashmir valley in 1990 are remaining as it is. We have to create conditions so that our these brothers can lead a happy, dignified and secure life like other Indians by availing equal democratic rights and fulfilling democratic duties, even while remaining firm and devoted to their religions and national identity. For this just work, necessary Constitutional amendments will have to be made and old provisions will have to be changed. Then and then only, the residents of Jammu Kashmir can be completely assimilated with rest of Bharat and their equal cooperation and share will be possible in the national progress. Along with the State and Union Governments, society also has a vital role to play in this process. 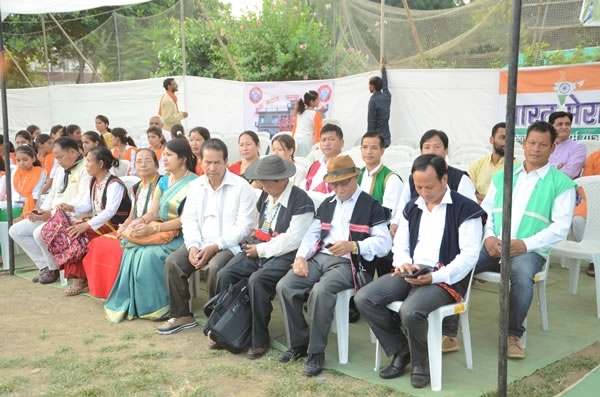 The citizens living in bordering areas are bravely and persistently holding the ground amidst incessant cross border firing and terrorist infiltration. In a way, they are also directly fighting with the anti-national forces. They have to continuously face the insecurity and chaos in their life and livelihood. Besides the relief from Government and administration, different social groups also need to establish contact there and should provide with the facilities as per their ability. 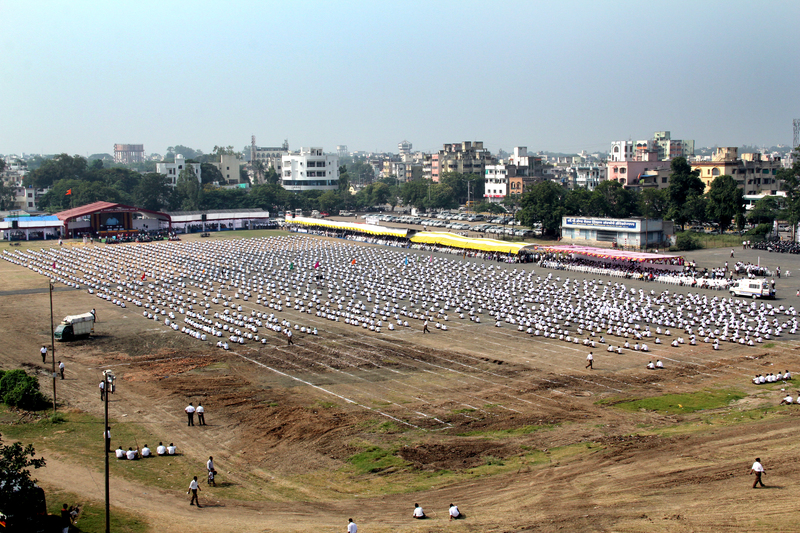 In this direction, Sangh Swayamsevaks have already taken the initiative. With the increased thinking and action on those lines, through collective efforts of Government and society, better systems can be in place. The need to take additional efforts in the field of education, health, livelihood and national values is also realised in the Kashmir valley and the remote border areas of Ladakh. To attain this goal, the conditions inevitably demands for constructive connect from the society and different programmes for awareness, awakening and reshaping the public mind. To eradicate the poison of alienation and unrest created through the systematic and false propaganda over the years, the society will have to show the natural affection through these positive actions. The path for complete resolution of the issue will be facilitated when the entire society will stand behind the well thought policy of dealing sternly and strongly with the anti-national forces. This thought has also become all the more important when a dangerous game is being played by anti-national forces by stimulating the unrest, separatism, violence, enmity or hatred amongst group or local identities on the basis of language, region, sects, religion etc. Especially in the bordering states, attempts of creating atmosphere for disrespecting the Constitutional provisions on these lines are going on. The situation in Bengal and Kerala is known to all. The State Governments and their systematically politicised administrative systems are not only apathetic to this serious national crisis but are also lending a helping hand to the anti-national forces for petty political interests. Information pertaining to all these anti-national activities reaches to the Union Government and administration and they must be taking necessary steps to foil these nefarious designs. But, cross border smuggling including that of cow continue to be a matter of concern. Nation already has been facing the problem of illegal Bangladeshi migrants and now Rohingyas who are chased away from Myanmar have infiltrated and many more are ready to migrate illegally. They are being driven out of Myanmar mainly due to their continuous violent and criminal separatist activities and linkages with the terrorist groups. Any decision regarding them should be taken by keeping in mind that they will definitely be a threat to national security and integrity. The Government seems to be thinking on the same line. In such complex situation, success is not possible without cooperation of the entire society. For the purpose, all the Sajjan Shakti of these states will have to come forward fearlessly. 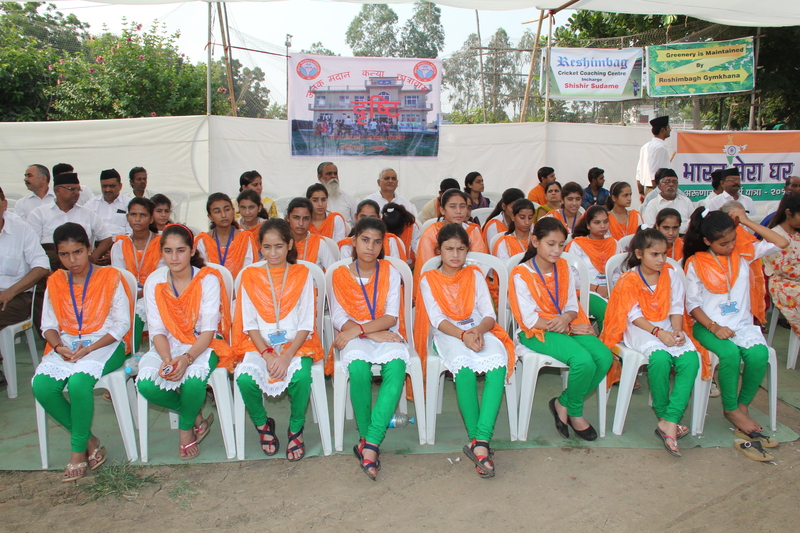 They will have to be organised, vocal and active and also make the society fearless, alert and enlightened. As a system, guarding borders and ensuring internal security is the responsibility of armed forces, paramilitary forces and police machinery and they have been doing this with full vigour, commitment and sacrifice since our freedom. However at the Government level, there is need to expedite the process of equipping them with adequate resources, improving their internal communication and coordination with the intelligence agencies, taking care of them and their families, ensuring national self-reliance in military hardware and providing enough manpower and training to these forces. The direct interaction of Government with these forces needs to be improved for this purpose. There are expectations from the society also of more affinity and respect towards our soldiers and their families. Besides right policies, in tune with national interest and ethos and in the direction of fulfilling the expectations and requirements, the need for organised and virtuous society with clear understanding of our national pride is also seen in every walk of life. It is also required that the administration should internalise the core of those policies and have the necessary mentality for effective implementation. The same conclusion can be drawn on the economic front. For controlling corruption, bringing speedy economic development, introduction of welfare schemes to the last person standing, like Jan Dhan, MUDRA, Gas Subsidy, agricultural insurance etc and some bold decisions are taken at the government level. Yet, the requirement of an integrated and holistic policy, which will take into consideration the diversity and various requirements of the nation; will address the needs of industry, trade, agriculture and environment together, will safeguard the interests of all from big, medium and small industries, to small retailers, farmers and landless labours, is very much felt. The compulsion to move on the currently accepted global policies and standards, even if they are faulty, artificial, create a mirage of prosperity, cause erosion of morality, environment, employment and self reliance; can be understood to a certain extent. However it is also universally being recognised that all these policies and standards need a rethinking and nation specific unique models of development should evolve. Our Niti Ayog and economic advisers of the States will have to come out of the same old economic ‘isms’, and will have to integrate the most up-to-date economic experiences with the ground reality of our nation. This process will have to systematically consider the national ideals, traditions, needs and resources together. People will also have to relentlessly insist on buying the Swadeshi products while fulfilling their day to day needs and doing other purchases. The Government schemes and policies are made sincerely for the welfare of common people. They should also encourage the people to be entrepreneurial and active. A system should be in place to gather the realistic information from all the sources about the execution and impact of these schemes while percolating down to the lowest level through the administrative system. There is an enduring confidence in the sincerity of the Government, decisive nature to make the necessary transformation, integrity and character of the people in important position and their diligence. If this fortune that we have got as a nation after so many years has to deliver, then the above mentioned points will have to be taken into consideration. Despite being faulty, the parameter of Gross Domestic Product is still used to measure the health and progress of economy. Employment, that is work for every hand and enough remuneration for sustainable livelihood is a major consideration for us. On these parameters, the biggest contribution is made by the small, medium and handicraft industry, retail or small self-employed businesses, cooperative sector and agro and agro-allied sector. They are also our security net during the ups and downs in the global trade and economic earthquakes. The roots of our family system are still strong and women are also contributing in family income by doing small business activities at home. Sometimes this is also called as informal economy. The level of corruption is also low here. Crores of people get jobs or employments through these sectors. Most of the people standing in the last line of the society are also from these sectors. While reforming and cleaning the economic systems, although some tremors and instability is expected, it should be kept in mind that these sectors should feel the minimum heat and ultimately they should get the maximum strength. Due to the values enshrined in our traditions many Governmental institutions, voluntary organisations and big industrial corporations, even before the concept of Corporate Social Responsibility was prevailing, are striving for improving the life of these people, enhancing quality of their products as well as skill sets and facilitating market access for them. Synchronizing all those efforts can be one of the directions to go ahead. Altogether, our dream of presenting a model of Antyodaya at domestic level and that of balanced, sustainable and dynamic economy at the global level is not possible unless our economic thinking is not based on decentralising economic production, restraining consumption, increasing employability, conserving energy, securing environment and taking the individual on righteous path. While moving ahead from the present economic condition this fundamental point should be remembered. There are many provisions at the Union and State levels for the benefit of deprived sections of the society like Scheduled Castes, Scheduled Tribes, and Nomadic Tribes etc. Those benefits should reach to everyone from these sections. Government and administration should be alert and sensitive to this. There is a need for urgency with care on the part of government agency and sensitised cooperation from the society in this regard. In our country, industry, business and agriculture have not been considered as competing but as complimentary sectors. Agriculture is the large sector in Bharat. Our farmer, who is by nature, feeds not just his family but the entire nation, is in pain today. He is depressed after facing the onslaught of floods and droughts, export-import policy, meagre pricing, mounting loans and losing everything once the crop is ruined. There is a growing sentiment that the new generation will either become urban educated unemployed or working in farms will disrupt the education that will force them to be in villages that are without any facilities. Resultantly, villages are getting empty and burden on the big cities is increasing. Both are facing the crisis of development. The problem of criminalisation is growing in the cities. Appreciable schemes like crop insurance are being introduced, soil testing and e-marketing for agriculture products are also useful steps in this direction. Yet, Union and State Governments should be more vigilant to ensure effective implementation of these schemes on the ground. The measures like loan waivers are also signs of sensitivity and goodwill of the governments but these temporary measures are not solution to the problem. New technology and traditional non-polluting methods should be amalgamated for farmers so that they can do farming with less investment and without getting into debt trap. New technology also should be adopted only after ensuring through proper testing that it does not have any adverse long-term impact on the health of soil, environment and human beings. Farmers should get the minimum price with a profit range over his investment so that he can bear his family expenditure and save some capital for the next years farming. The purchases of crops based on the support price will have to be ensured by the Government. Organic farming, mixed farming and farming with cow-based animal husbandry should become a new trend. The chemical farming that is poisoning our food, water and soil and also increasing the expenditure of farmers should be slowly done away with. When we talk about the farming with less capital, organic in nature, naturally the point is raised that the large number of farmers in our country are small land holders, without any irrigation facility. For such farmers, cow-based farming is the easiest way out for poison free and less capital intensive agriculture. 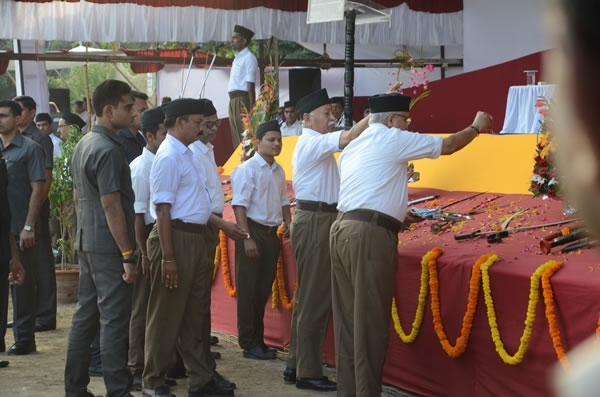 Therefore, Sangh Swayamsevaks, Saints of all sects, other voluntary organisations and individuals are running the activity of cow protection and promotion. In our Sanskriti, cow is an article of reverence. Cow protection is also included in Directive Principles of our Constitution and many states ruled by different political parties at different times have formulated laws regarding the same. The utility of Bharatiya breed of cow is scientifically proven now with the nutritional value of its milk that contains A-2, the medicinal value of cow-dung and urine for human being and animals and agricultural value with use in developing fertilisers and pest controllers that improve the soil health and save us from side effects. Many researches are also going on in this direction. The cow smuggling has emerged as a serious issue in all states and especially, on the Bangladesh border. In such a scenario, activities of cow-protection and cow promotion become more valuable. All these activities are undertaken by the activists within the legal and Constitutional framework. After inquiries in the recent incidences of violence and atrocities, it has become amply clear that these activities or the activists were not involved in those acts of violence. On the contrary many activists who were peacefully involved in cow protection were attacked and killed; this issue is neither discussed nor being inquired. It is unfair to link the cow protectors or entire activity of Cow protection with violent incidences or communal feelings without knowing or neglecting the facts. Many followers of Muslim faith are also involved in the activity of cow protection, cow promotion and management of gaushalas. Some of them told me that the nefarious campaign going on against the cow-protection unnecessarily creates tension among the people of different religions. In such a situation, cow-protectors and promoters who are piously involved in the activity should not worry or get distracted with the well intentioned statements by highly placed persons in the Government or remarks made by the Supreme Court. People who are criminals and involved in violent activities should be bothered about that. Vested interests are misinterpreting these statements to influence the larger public opinion. The government and administration should stay away from such misinterpretation and should ensure that the criminals get penalised and the innocents are not troubled. The legal and virtuous work of cow-protection and cow-promotion will go on in the interest of the people and will increase in coming days. It will also be the apt answer to the situation. Irrigation system is another important prerequisite for successful farming. We have to comprehensively think about the scientific management of the entire amount of water resources received every year. In the areas of poison-free farming and water management, Government has already taken the initiatives regarding water conservation, water protection, river cleaning, ensuring continuous flow of river water, rejuvenation projects and tree plantation etc. At societal level also many people are undertaking non-governmental and effective programmes on water management. Drives such as Rally for Rivers are also going on connecting water with tress and jungles. At some places, appreciable steps are being taken to authorise dwellers of forest villages with the responsibility of protecting and maintaining jungles. This is a positive sign. There is hope that these efforts collectively will bring in a new prosperous model in agriculture and environment. In the national resurgence, collective endeavours of society are more important than the governmental and administrative efforts. In this perspective, education system is important. During the colonial period, foreign rulers brought in many disastrous changes in the education system, curriculum and management. Creating the sense of inferiority in Bharatiya social mind was the main objective behind that. Education will have to get rid of those impacts. New education policy should be carved out in such a manner so that education becomes affordable and accessible even to children and youth living in remote jungles and villages. The curriculum should remain free of all kinds of ‘isms’ and instead should be based on knowledge of seeking truth, leading to comprehend our nationality and national pride. This education should inculcate the qualities of self-confidence, desire for excellence, knowledge, studiousness and hard work in each and every student along with the values of character, politeness, sensitivity, discretion and responsibility. Teachers will have to bond with the students and educate them with their own example. Even the atmosphere in educational institutions should be conducive to this. Right kind of infrastructure, along with equipments, libraries and laboratories will have to be created. To end the commercialisation of education, Government schools and colleges should be run with a certain minimum quality. Many experiments are being done in the society; they will have to be taken into cognisance. Proper livelihood for the teachers will have to be ensured. I am making this repetitive assertion in the hope that the long-awaited Education Policy which will radically change the education system will be presented to the country as soon as possible. However, does process of learning take place only in schools? Don’t we get lessons of honesty and fairness, right human conduct based on compassion and sensitivity in the words and actions of our own family members, parents, other elderly people and people in our neighbourhood? Isn’t our minds and thinking getting shaped by the festivals and other activities, movements and initiatives we undertake in the society? Isn’t our media, especially the internet media impacting our thinking and actions? The game of Blue Whale is a classic example of this. To save our innocent kids from these vicious circles, family, society and governments will have to take the effective steps. The recent incidences of coming on streets for every small reason, citizens resorting to violence showing insensitivity and disrespect towards duties, laws and the Constitution, taking benefit of such situations by the anti-social criminal elements and anti-national forces who want to disturb the faith, integrity and peace in society, all these are the direct outcomes of degrading moral values and sense of responsibility in the society and unrest in social sections or selfish politics played around it. The family and society should also impart the values of virtuous personal and social conduct to the new generation. The selfish politics thrives on differences, unrest and conflicts cropped up in the society due to evils of exploitation, inequalities and insensitivities. This is the direct result of absence of Samarasta. 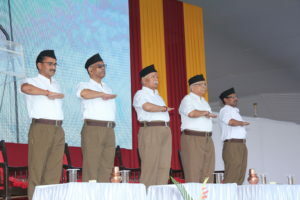 Along with the Sangh Swayamsevaks, many organisations and individuals are already working relentlessly through their selfless connect and service and trying to create the atmosphere of justice, empathy and Samarasta. However, to achieve the desired results, entire society will have to get rid of the contradictions of evil practices and conduct and imbibe the virtues of cognate and egalitarian behaviour. We all will have to commit ourselves and be active after refining all aspects of our life with this approach. Therefore, in the present condition, the organised, qualitative and disciplined march of the society is as much necessary as the formulation of policies based on Bharatiya values by the Governments and an honest transparent and flawless execution of the same by the administration. The Eternal Bharat is reincarnating itself with the requirements of new age. 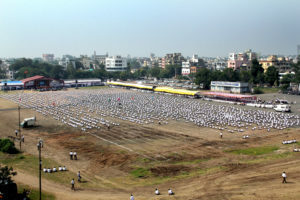 All virtuous people with their efforts in various fields are ready to welcome it. Now social preparedness is the need of the hour. 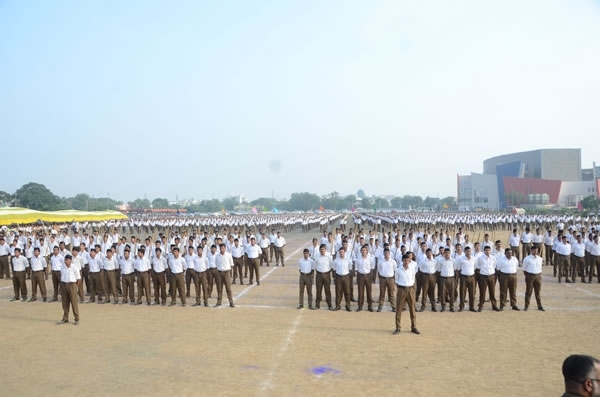 Since 1925, Rashtriya Swayamsevak Sangh is striving for this. While entering the 93rd year of its inception, Sangh is trying build a nation-wide conglomeration of Karyakartas (activists) who have the clear understanding of our Rashtra, who are daring enough to articulate that with the same clarity, who are cherishing the devotion for this sacred and unified motherland and sensitive and affectionate towards each and every member of this family, the courage and sacrifice of our ancestors is the foundation of whose heart, and taking this nation to the pinnacle of its glory is the only inspiration of his collective aspirations and actions. This work is continuously growing. 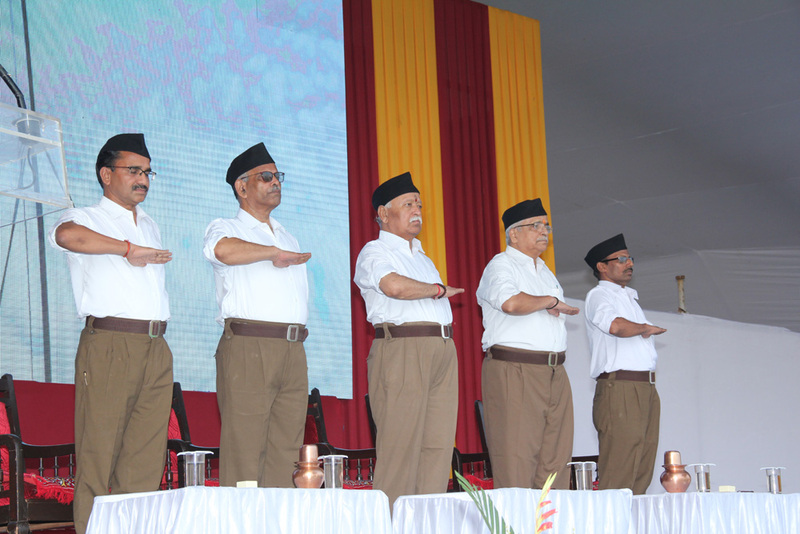 Sangh Swayamsevaks are active in each and every walk of national life and they are inculcating the Sanskaras through their presence. 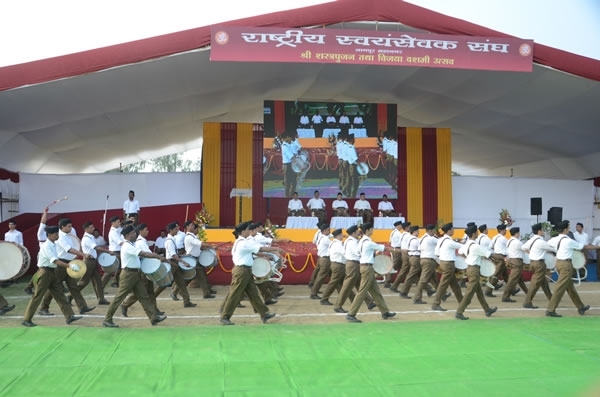 Swayamsevaks active in many allied organisations and institutions are running more than one lac, seventy thousand projects and serving the deprived sections by taking the society along. The complete picture of organised and virtuous society through the environment created by these efforts will eliminate the flaws of divisions, egocentric attitude, idleness, self-abomination etc. This is the unique and unparallel way of integrating and organising the society. The participation of all of you is necessary in this process. The right policies based on our ethos, excellent implementation and cooperation of all Sajjan Shakti and on the basis of that organised, industrious and integral social conduct is the fourfold combination that can lead to the manifestation of Bharat as an all-prosperous Vishwaguru in coming decades. This kind of conducive atmosphere is experienced everywhere, it is our duty to quickly seize this opportunity.